Magazines, print encyclopedias, library copies of textbooks, a printer, tables and chairs for forty, a large projection screen and the circulation desk are available in the JDHS Library's main floor area. The JDHS Library subscribes to thirty-two different periodicals. Some of these periodicals are published every week, monthly, or every two months. 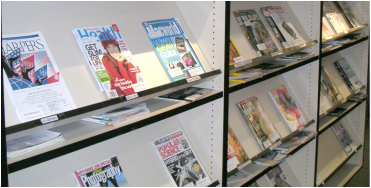 Current issues are displayed on the top shelves and are to remain in the library for patrons to read when they visit the library. Past issues, which are on the flat shelves under the current issues, are available for check-out. Click here for a JDHS Library subscription list. Printed edition of the World Book Encyclopedia are available for use in the library. There are also supplies for working on projects and textbooks that students may use in the library to study or finish assignments.